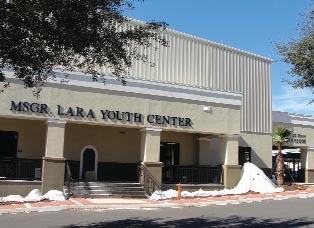 On Saturday, February 5, Nativity Catholic Church of Brandon will celebrate the grand opening of the Monsignor Lara Youth Center and Sister Irene Gymnasium. Nativity Catholic Church of Brandon has much to celebrate during this its Golden Jubilee Year. The long-awaited Monsignor Lara Youth Center and Sister Irene Gymnasium were dedicated earlier this month. Bishop Robert N. Lynch, Diocese of St. Petersburg, presided over a Mass prior to the dedication. The church will celebrate the grand opening of the facility on Saturday, February 5, and Sunday, February 6. The community is invited to join the parish in celebrating this milestone. A variety of activities have been planned for the grand opening weekend. A 5K Run/Walk will take place on Saturday in the morning, followed by the Youth Center grand opening rally with guest speakers at 12 Noon. Some of the activities planned include basketball lessons and games, volleyball, face painting, crafts, bounce house, band concerts and much more. The Youth Center is named after the Pastor Emeritus of Nativity Catholic Church, Monsignor James C. Lara, who was pastor for 30 years. The gymnasium is named after Sr. Irene St. Jean, CSC, who served as principal for 27 years. Sr. Irene passed away in 2004. The cost of the construction of the project was funded through the generosity of donations to the “One Heart” campaign. The parish is made up of approximately 5,800 registered families who generously supported the project as part of a long needed addition to the campus. The school has 774 students enrolled in grades Pre-K3-8th grade. Nativity Catholic Church is located at 705 E. Brandon Blvd. in Brandon. Please visit www.nativitycatholicchurch.org.